James King is a realist painter who credits the influence of Jimmy Abeita for much of his inspiration. In fact, his artistic ability was recognized by his family and teachers early in life. He was born in Shiprock, New Mexico and began experimenting as a youngster with "shoe polish and house paints." The most exciting part of creating a painting for King is the beginning. "I like the fast reckless strokes of colors as I set up my compositions. Sometimes I like the first stage so much I dry them and just stash them away." "My ideas come from experiences, events, and images that refuse to leave me alone." He attended art school in Salt Lake City and was considered a rebel, Passing his final painting class with a "D". He didn't fit into the professor's looser artistic style. King paints with oil on canvas. In 2002, he won the Best of Show at the Heard Museum. 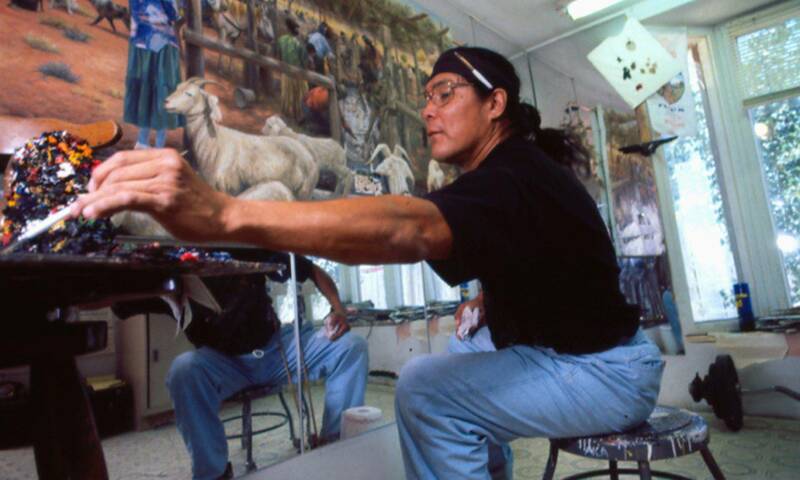 In 2005, he won the Best of Category at both the Santa Fe Indian Market and the Gallup Inter-Tribal Ceremonial. He has also ridden the Iron Horse Bicycle Classic.